Support our 3rd annual LGBTQ people of color conference in the Rio Grande Valley of south Texas! Our conference will take place on Friday, Sept. 22 and Saturday, Sept. 23 at the STC Cooper Center in McAllen, Texas. Together, we will explore our theme of "Violence By Policy." In the past year, we have seen serious legal and socioecnomic challenges against our communities. During our two-day conference, we will discuss the moment we're in, where we can go from here, and how we can move forward and WIN. Aquí Estamos is ran entirely by community members who volunteer their time to create safe spaces in the Rio Grande Valley and to advocate for our liberation. We are fully committed to the success of our organization, but we need your help! Supporting Aquí Estamos by making a donation today. 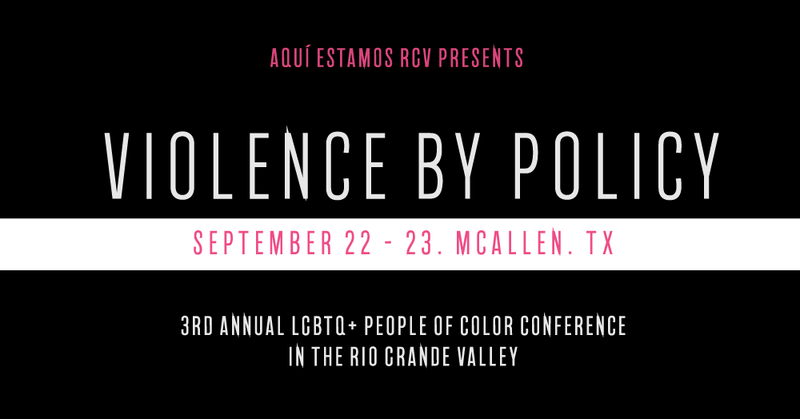 Our annual conference is one of the few FREE LGBTQIA+ and queer people of color conferences in the U.S., and it is the first of its kind in the Rio Grande Valley. We also provide free transportation for people in the Rio Grande Valley to attend, food and drinks, and all accessibility requests. One hundred percent of all donations go toward organizing the conference and events leading up to it. Aquí Estamos is a youth-led, LGBTQ people of color organization in the Rio Grande Valley of south Texas, a region along the U.S.-Mexico border. Learn more at aquiestamosrgv.org. Support Aquí Estamos 2017: 3rd annual LGBTQ people of color conference in the RGV!